Nate has been obsessed with fly-fishing and tying since age 13. He's currently a student at a local community college. Next year he hopes to head out to Billings, Montana to work for a degree in Medical Chemistry… and fish for the browns and ‘bows of the Bighorn. I really didn't have any faith in the day when I looked over the bridge and saw nothing but chocolate milk. But I was there, and decided to walk upstream a bit and give it a try. A friend once told me that when things are looking bad, try making it better by overcoming what hinders you. Well, in chocolate milk, all a guy can do is have a visible fly. So I knotted this fly on the end of my leader: an ugly thing consisting of ten feet of ten-pound Trilene, to which was knotted a foot of 4X, with four (yes, 4) split shot above the knot. I hoped it would get me down to where I needed to be. It did. I was fishing as I would for steelhead- let the shot hit bottom, then just let it drift in the current, occasionally tapping the bottom in its drift. I believe it was on the fourth drift, when a side current pulled my rig closer to my feet, that the rig stopped cold. Figuring it was some Wisconsin real estate, I yanked straight up, expecting to have a fly with some moss on it shoot out of the water less than a yard in front of me. It didn't happen that way. It just came up real slow and heavy, and I remember my thought being, "Phooey, another stick." Then it shook its head, and went over 50 feet downstream to just shy of the bridge, in less than 3 seconds. Like a typical big trout, it shot straight over to the other bank and bull-dogged a bit, slowly working upstream with heavy headshakes interspersed. It tried to bury itself in a stand of sunken timbers, but I managed to pull it out of them and brought it across the river, almost to my feet. I had leader in my guides when all the stops were pulled out. It just went downstream. And kept going. I was under the bridge with water coming in under my left armpit and my fly line shooting down river with backing trailing after it when… all went slack. I cranked up what I had left only to find the scourge of knot-tiers: a knot that broke at the hook eye. Now all I have to say is this: I've hooked and landed a few 18-inchers before, some in heavy current. This was much, much stronger and heavier. I can't say exactly how much, because I never saw the fish, its tail or even a boil. Still drives me crazy when I think about it. 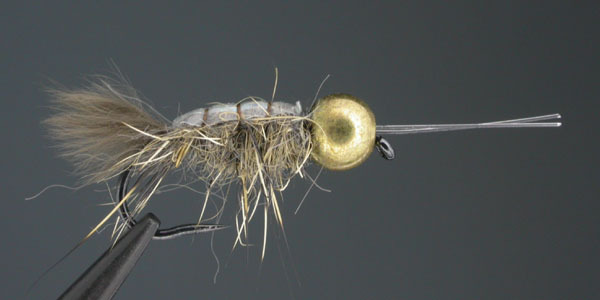 This fly was tied as a joke, given the huge gold bead at the front of an already large fly. However, it is responsible for the largest hookup I've ever had on a trout stream, or any stream for that matter.